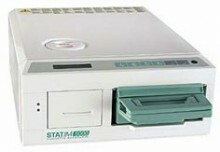 The Statim 5000 w/ printer is fully automatic. Simply select one of four sterilization programs and with a single touch of the keypad, begin the cycle. An advanced microprocessor controls all functions and maintains optimal sterilization conditions, from start to finish. * Cycle times do not include drying. Please allow 1-2 days processing. Delivery time is 1-2 weeks. Most sterilizers arrive sooner. ALL OF OUR REMANUFACTURED STERILIZERS COME WITH A 90 DAY WARRANTY AND A LIFETIME OF TECHNICAL SUPPORT!! Click the button below to add the SCICAN STATIM 5000P AUTOCLAVE STERILIZER to your wish list.